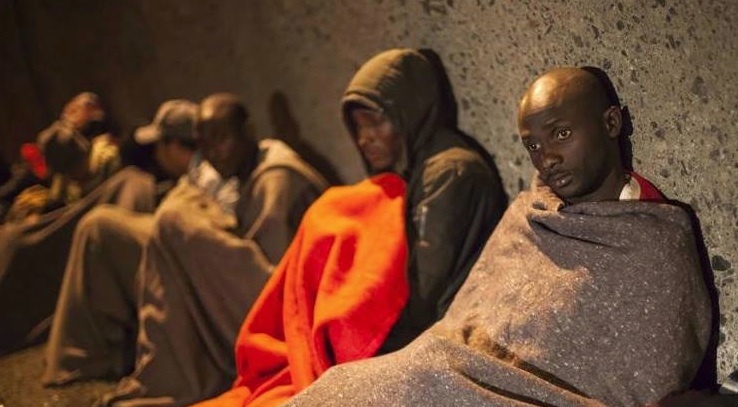 There’ve been several photos of undocumented African immigrants to Europe in the past few days because the Spanish coast guard rescued over a thousand traveling on rafts across the Strait of Gibralter between Morocco & Spain. The photos of those rescued are very poignant: some show mothers with infants; others show immigrants who appear shell-shocked from their ordeal. Most are likely malnourished & many are sick. All have been through hell. 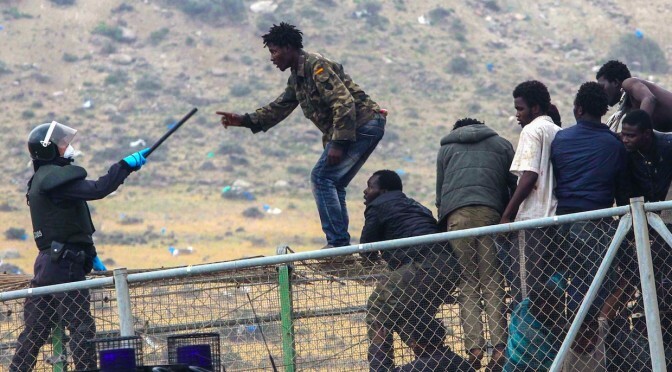 Nearly a thousand also tried to scale the triple-layer, 20-foot razor wire fence that separates Morocco from Melilla, a Spanish territory in north Africa, where they can try to gain entry to Europe to find work. 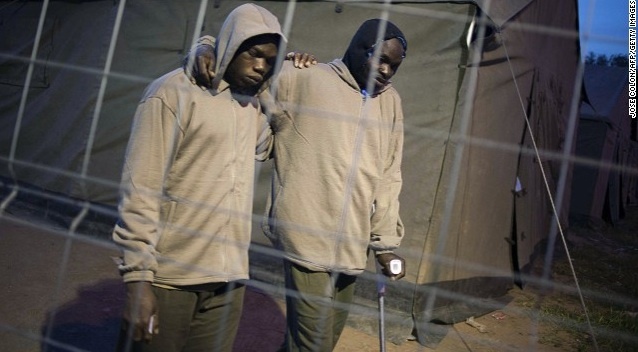 This photo at Melilla is not the poignant genre. This is of from the white supremacist album–& not as metaphor. 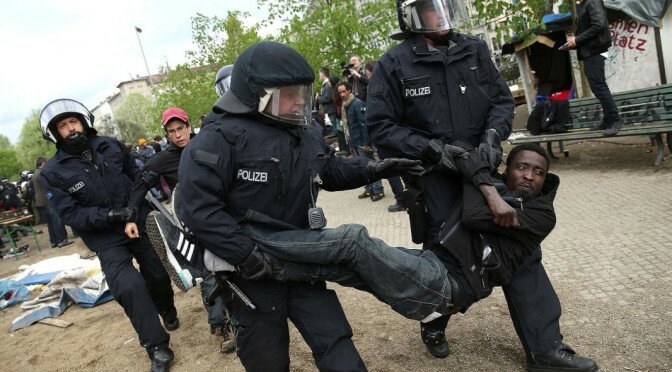 Forcing malnourished, traumatized people to risk life & injury while watching nonchalantly, arms akimbo, or trying to beat them back with truncheons could not be more malevolent or repugnant–or more indicting of European Union immigration policy which endangers human beings & humiliates them in the bargain. Does anyone else find this scene reminiscent of the psychos in the hills of Sderot, Israel watching ethnic cleansing in Gaza? Because the impulse behind it is exactly the same. Immigration is a human right & human beings have the right to do it with dignity. Tear down Fortress Europe & replace the psychos running the place with those who recognize & honor a human being when they see one. Open the borders! No human being is illegal! There’s a world of hope & dreams invested in these young men who were among a group of 22 immigrants from Africa, including two women & six children intercepted off the coast of Spain near the Canary Island of Gran Canaria. Half are sub-Saharan Africans, half are from the Maghreb region of northern Africa. Their overcrowded boat described as “makeshift” ran adrift after it lost engine power & had to be rescued by the Spanish coast guard. “Rescued” of course is a qualified term for undocumented immigrants. 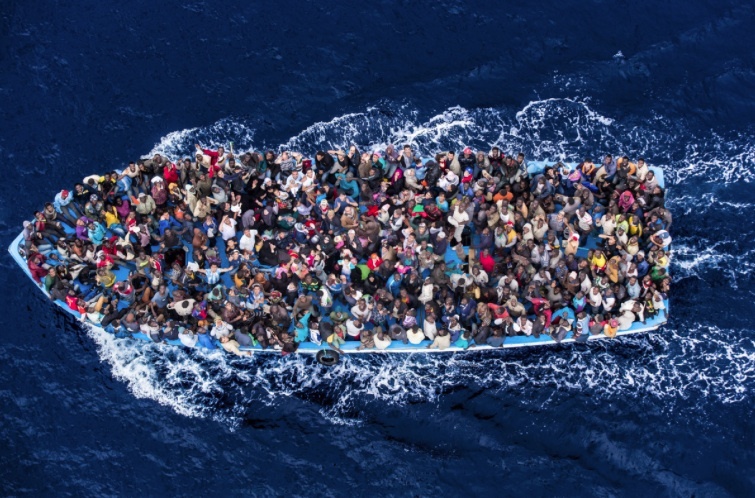 They didn’t drown in the Meditarranean Sea like so many thousands of fellow immigrants but they will be incarcerated, processed, & most will be deported & dumped back somewhere on the African continent. You can see how elated they are to be “rescued” because many have entire families dependent on their getting into Europe to find work & send money home; many are refugees fleeing war; many have been dispossessed by neoliberal plunder. 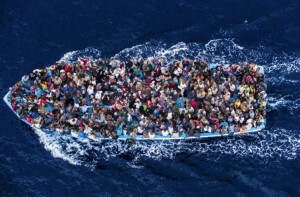 All of them are desperate or they wouldn’t risk their lives in a makeshift boat that could prove their doom. Working people around the world are inundated with agitation against immigrants, as if they’ve come to take our jobs or go on the dole. That’s a classic divide & conquer device that plays well among those fearful for their jobs, especially when it’s orchestrated with racism. So one of the most promising political developments in several countries is that immigrants are standing up for their rights fearlessly. Our heartfelt solidarity with their struggles. Immigration is a human right! Open the borders! Tear down Fortress Europe! African immigration to Europe: Immigration is a human right! Open the borders! 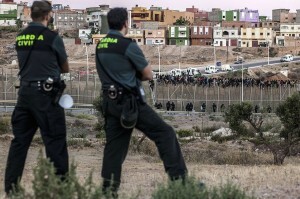 The tough one here is not the military cop in riot gear wielding the baton but the unarmed immigrants trying to rush the border fence topped with razor wire to cross from Morocco into Melilla, the north African enclave owned by Spain. They hope that by getting into European territory they stand a better chance of making it to the European continent for work. Most who get past the daunting impediments arrive with extreme injuries from the razor wire, from being beaten by border guards (both in Morocco & Spain), from falling, & are malnourished since they’ve just spent weeks coming from their own countries. There isn’t a lot of available reporting about how they transit great distances, several borders, & difficult terrains to get to Morocco. If it’s anything comparable to what Central American & Mexican immigrants go through to get to the US, it must be a living hell. On this occasion (May 1st), 400 immigrants stormed the border fence but only 150 got through. 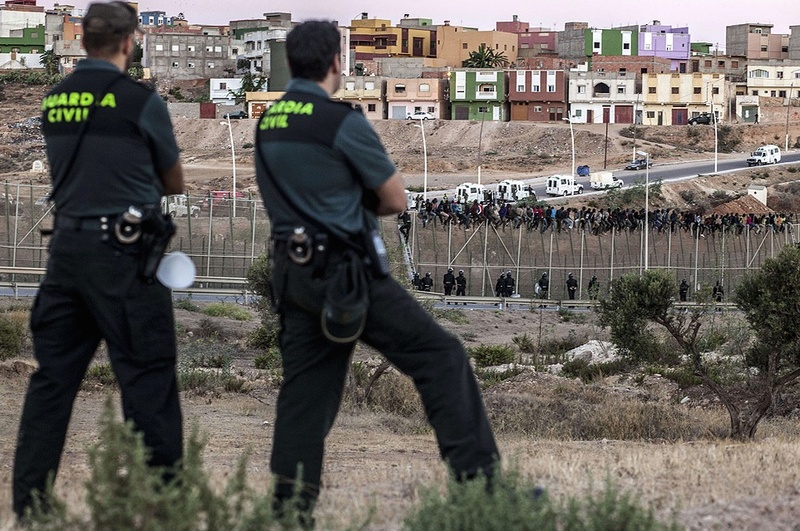 Those who were pushed back will camp in makeshift tents & be subjected to harassment by Moroccon police acting as a southern flank of European immigration policy. Those who do make it are not assured of moving on to Europe & are often deported & dumped back in Morocco. How did human society come to this? How did such barbarism become the dominant political ethos of our historic era? More importantly, how the hell do we get rid of this social gangrene that forces people from their families & cultures, endangers their lives, & humiliates them as if they were beasts? The growing combativity of immigrants in staking their rights to immigrate is a development of the greatest importance & ought to make our hearts sing. As the US immigrant rights movement chants, “No human being is illegal.” The only way to make those damn fortresses come down is to stand with them in a solid phalanx of solidarity. Neoliberal predation acknowledges no national borders & neither do we.